Eurolase presents exclusively the latest laser of Dimetix. 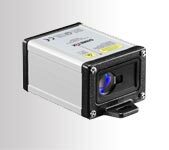 EDS-C distancemeter laser is the new generation of powerfull and strong sensors, developed to meet industrial measure requirements. It is the perfect solution if you need a simple configurable analog signal, offering same results as other lasers from Eurolase. Combined with a wide range of electrical and mechanical accessories, EDS-C offers a complete and specifical solution for different activities such as metallurgy, wood and paper industries, as well as storage. These efficient and economical sensors offer a professional answer to professional people.